Offering you a complete choice of products which include apex ldpe three layer blown film machine, blown film plant and blown film line. 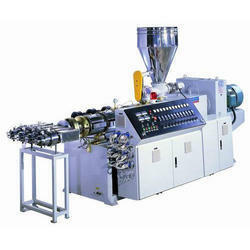 Mono Means Single , So here For Mono Layer Extrusion its Single Extruder and the size of the screw is depending upon Size that has to be Manufactured .This Machines are made in to Process HDPE or Commonly term used is HM and LDPE . From Extruder when Granules are Melted at Required Temperature it goes to Die Where in a Bubble is Form to Round Sheet so Die is Round in Structure , After Forming the Bubble it Goes towards upward and from there it goes to Nip Roller and then it Comes Downward to the Winder . Also there is a Huge Percentage of Re-Process Granules is used and in some cases 100 % reprocess granules is used so we ensure the Screw Barrel is Designed in Such way that it could process Re-Process Granules . Now further to this at Leena Extrusion for Mono Layer Die is Supplied in Sprial Type or a Rotating Type . A spiral type Die head manufactured Film has Variation in Gauge or you could say that Thickness of the Film is not accurate Where in Rotating Die works its Opposite it ensures that there is no variation in the Thickness of the Film . Mostly We provide Machine with Thickness of Minimum of 15 Microns to 100 Microns however this Machine are also Designed Customize as per Customer Request . Also the Winders which are Provided are in Two Types , One is Single Winder and Another Back to Back Winder . 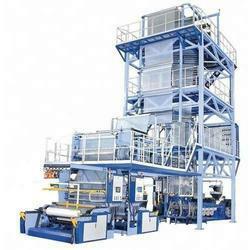 A single Winder is used for Business people who wants Film in Tube Formation and also we Provide Gusseting Option onine so the manufacturer could have Gusseted and Non Gusseted Rolls . A back to Back Winder is Provided when the Customer wants Film in Tube Form so with help of Two winders he could get Rolls in Sheet form . One of the Important Feature is that if the Customer wants that his Manufactured Film Could be Printed , so such case Customer has to have Rotating Die and a Corona Treatment . It Could be Sigle Side Treatment or Double side According to requirement of our Client . The Films Which are Manufactured from Mono Layer one of Most used Article is Carry Bags which we day in out use , Like Street Hawkers , Provision Stores , Garment Shops , etc most of this Carry Bags is Manufactured from Mono Layer . Apart from this there is a Huge amount of Linear which is used in Fertilizer , Grains , Vegetables in Wholesale market which is Formation of LDPE and is manufactured from Mono Layer . There are also Various Kinds Of Pouches Which is Mostly Used in Bakery Shops , Provision Shops , Super Market in order to Pack and its also Make of LDPE .At Leena Extrusion We carry all possible Models of Mono Layer Blown Film Plant and could be Supplied as Customer Request depending upon the Final Application Needed from our Clients . We are a trustworthy organisation in offering a wide gamut of Blown Film Plant. We are a trustworthy organisation in offering a wide gamut of Blown Film Line.